I have a nice view from my office building in Tysons Corner: more office buildings. I’ve sketched the view out the window a few times, but here’s another try from today during my lunch break. The light was kid of interesting, and I embellished it a little. I was also interested in the tall trees obstructing the view. I made them a little more pronounced. I was also excited to try out my new Isabey red sable pocket round. 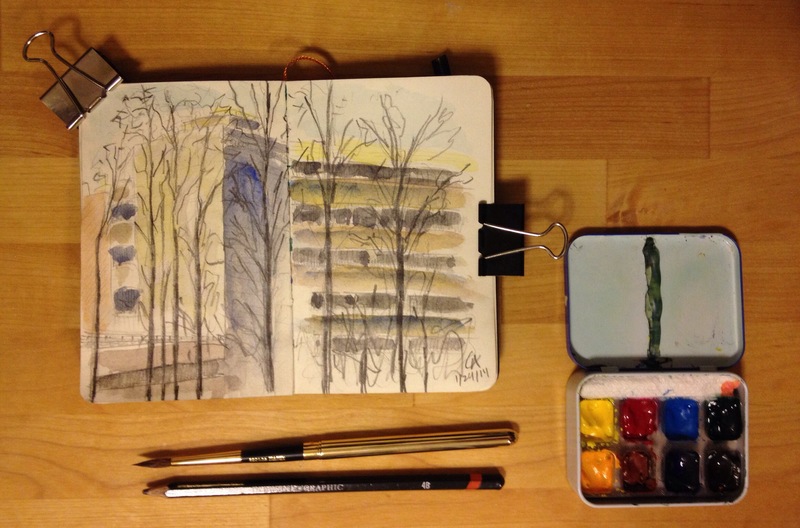 I plan to do a lot more sketching around work–Tysons is undergoing a big transformation, so once I can go outside again, there should be some good sketching opportunities–and I want to get my compact set up in order (shown above). It was a nice experiment today. Much better using a real brush then the waterbrushes I had been using for this sort of work. Wow, Corey! I’ve spent part of my evening, looking through your 2014 watercolors and sketches. You’re more prolific than I was during my “better” days. I’m very impressed with your output, and your willingness to push the boundaries. I hope your enthusiasm and energy continues unabated. You do inspire me so! Corey, your work is inspiring. I’m trying to notify you of this, but my posted comments are being rejected. I don’t know what the problem was, but I’m able to post comments now (and have looked at several of your recent works and responded). I would like to get back that prolific edge I knew the past couple of years. Work schedule has been absolutely brutal the past 5 months.